Plus one more thing, NodeJS. In this post, I'll show you how to make the aforementioned technologies work. TL;DR. Out-of-the-box, hot-reloading works, but dynamic import won't work. If dynamic import is made to work, both hot-reloading and node won't be able to work. There's a solution to these problems though. The hot-reloading from react-hot-loader's TypeScript example is not working if code-splitting is used, though the page automatically refreshes whenever the code is changed, the whole page reloads instead of just the part that was changed, and the states reinitializes too. Even if the changes are coming from non-code-splitted code, the whole page reloads and the states gone. Code-splitting requires setting tsconfig.json's module to esnext, and it also requires removing the babel-loader from webpack.config.js, babel-loader is used by react-hot-loader in order for hot-reloading to work. react-hot-loader works with module set to commonjs only. Another problem that arises from code-splitting, since it requires setting the tsconfig.json's module to esnext, codes written for node can't be run anymore. At the time of this writing (node version 8), node does not support ES modules. 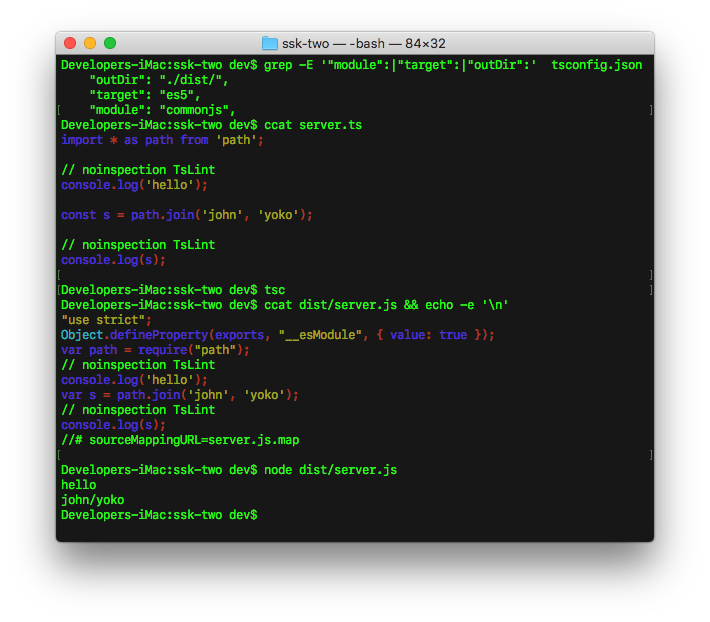 The only way for a TypeScript-generated code be runnable on node is by setting its tsconfig.json's module to commonjs, not esnext. Node working: check. Node works by setting the module to commonjs. Hot-reloading working: check. Hot-reloading is working again as tsconfig.json's module is set back to commonjs. With tsconfig.json's module set to esnext, webpack can split the code (theCompany.chunk.js) from the code that uses await import. 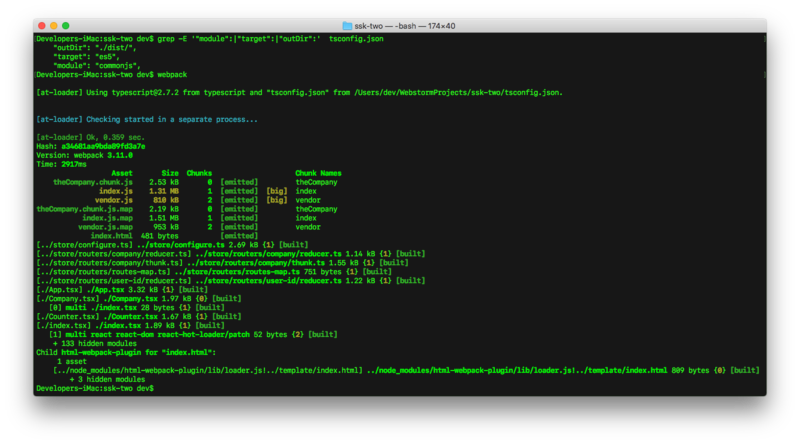 Now let's try setting tsconfig.json's module to commonjs, then run tsc. 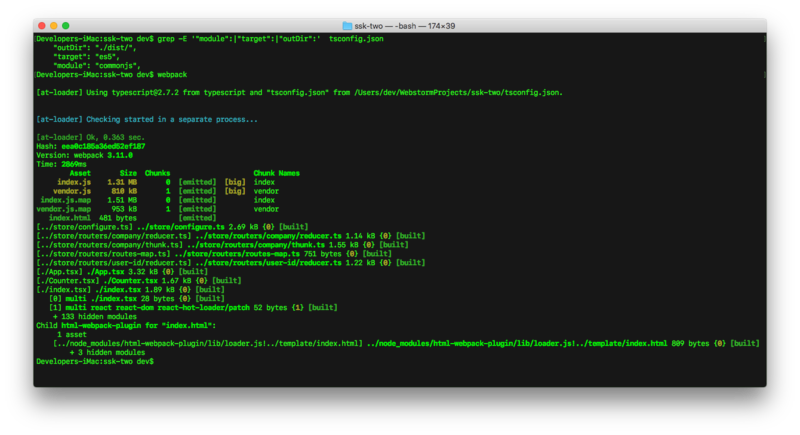 Note: for ts.config that has esModuleInterop compilerOptions set to true..
Hmm.. that's something different. When the module is set to commonjs, TypeScript generates Promise.resolve instead of keeping the import statement. Now let's check if webpack can apply code-splitting given the code above. 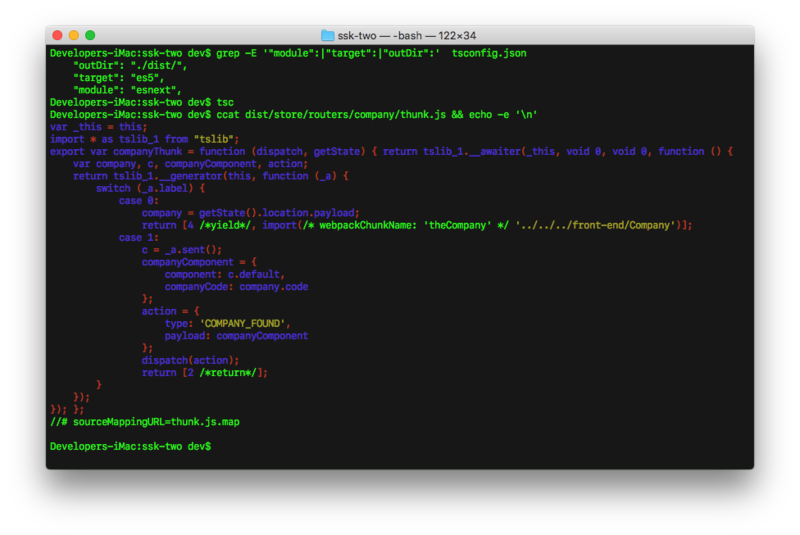 Well that's sad, the file theCompany.chunk.js is not splitted from its parent code. 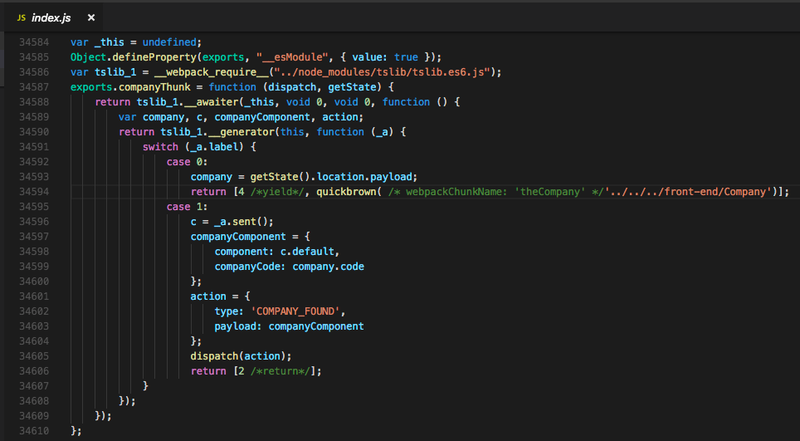 The file theCompany.chunk.js is not generated by webpack. 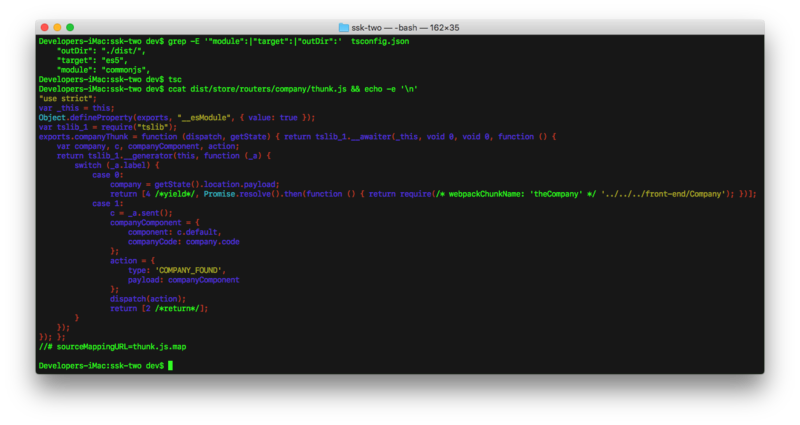 Now let's take a look at the code that dynamically imports the file theCompany.chunk.js. If we can only nudge TypeScript to keep the import statement despite the tsconfig.json's module is set to commonjs instead of it generating Promise.resolve+require, Webpack will be able to split the code afterwards. Unfortunately, there's no configuration in tsconfig.json that can keep the import statement when tsconfig.json's module is set to commonjs. With that said, we can use webpack's string-replace-loader to revert all those generated Promise.resolve statements to dynamic import statements instead. 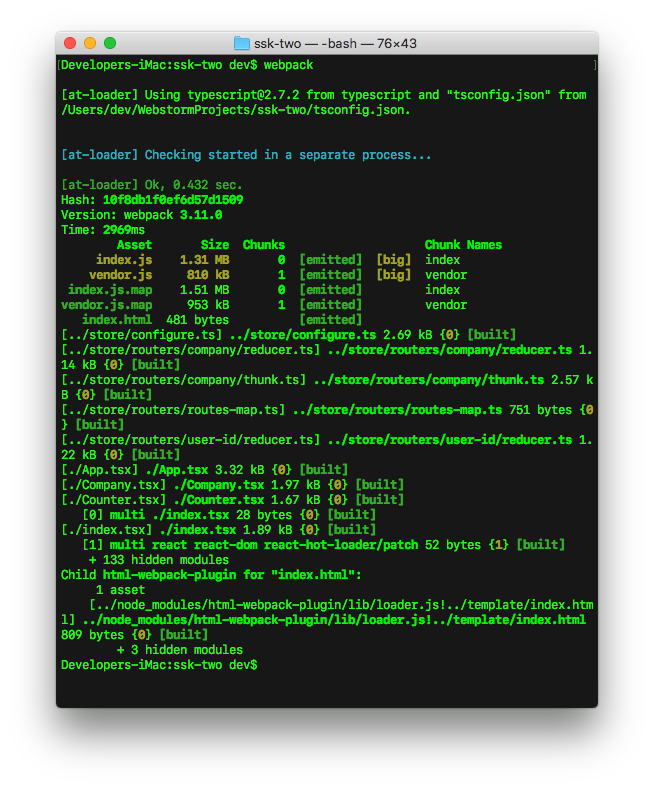 Do an npm install or yarn add of string-replace-loader. The file theCompany.chunk.js is not splitted from index.js since Webpack cannot find any dynamic import statement from the code applied of string-replace-loader, we used quickbrown statement in string-replace-loader. Webpack is now able to split the file theCompany.chunk.js from index.js as it now sees the dynamic import statement. Lazy-loading a module using import and code-splitting working: check. 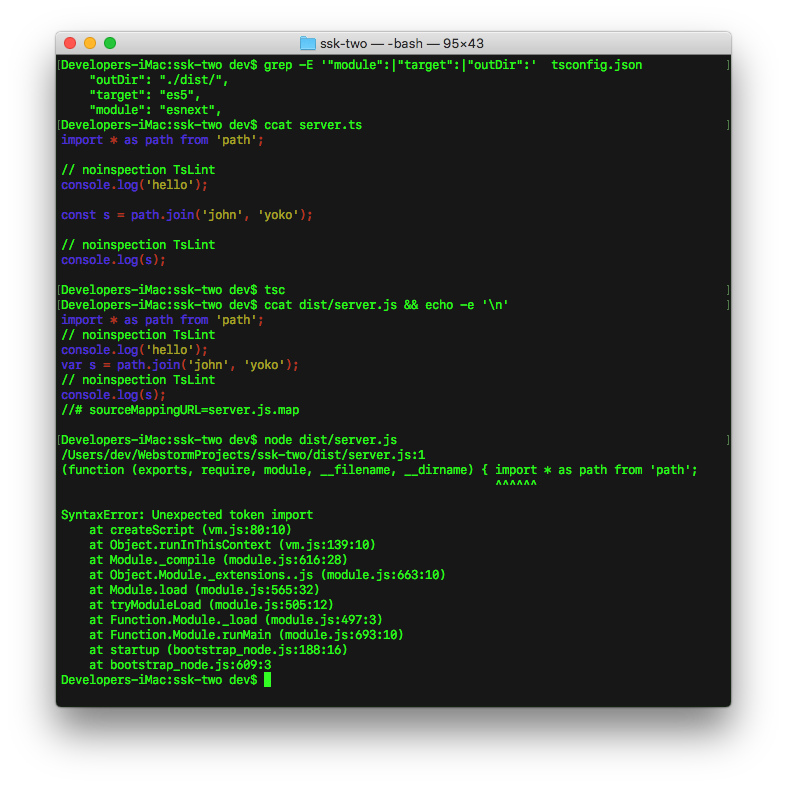 Code generated from TypeScript is compatible with node: check.